GIVEAWAY: WIN A PAIR OF HUNTER WELLIES! So lucky for you lovely people, I’ve teamed up with Hunter to give you the chance to win a pair of their classic tall boots, perfect for the coming festival season! As you all know, Hunter is the wellie of choice for all the big names when it comes to festivals such as Glastonbury, so if you’d like to get your hands on a pair then look no further. Before I head into the competition rules and details on how to enter, I thought I’d show you some of my favourite footwear currently available from Hunter. They don’t just do wellies you know, there’s also a range of summer sandals and lovely slip on shoes, so come rain or shine there is something fit for any weather. 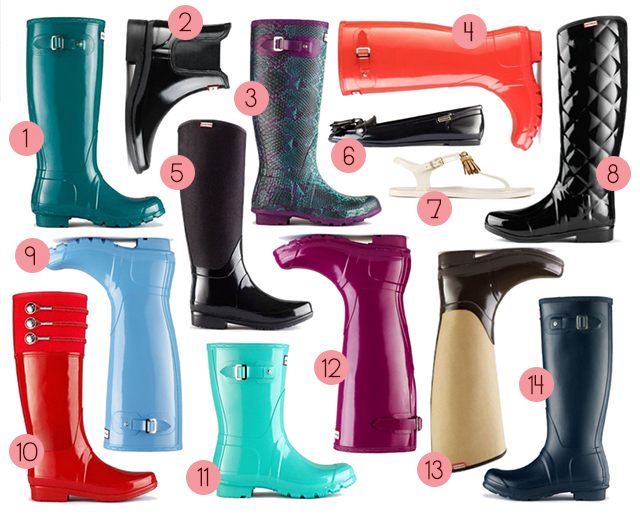 My favourites are the bright glossy finish wellies, and the gorgeous black quilted beauties. I’m loving all the summery colours available, bringing the boots bang up to date and giving a big splash of colour and fun to any outfit. So, to be in with the chance of winning a pair of Hunter Original Tall Wellies, all you need to do is be a follower of my blog (either via GFC or Bloglovin) and go over and ‘like’ the Hunter Facebook page. These are mandatory entry requirements, but there are lots of other ways to gain more entries, making your chances of winning even higher! Just fill out all the relevant details in the Rafflecopter widget below to enter. Simple as that! The competition will run until Sunday 26th May, and the winner will be announced within the following 48 hours. All the Ts & Cs are stated in the widget below if you wish to see them. Good luck and a huge thank you to Hunter for supplying such an amazing prize! I've been lusting after Hunter wellies for SO long now, they are just gorgeous. I'd love a pair to wear at V festival this summer, my Primark wellies just destroy my feet! This must be the best giveaway ever!! Oooh, I have always wanted to own a pair of Hunters! is it open intl ? This is an amazing giveaway, I'd love to own a pair of Hunters!